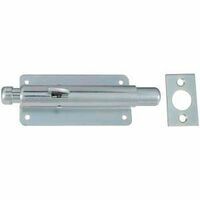 Designed for use on cabinet, double screen, garage and industrial doors. Operated by pressure of the foot on the cap. Released by pressure on the tip. When released, the bolt is retracted by a strong hard-drawn wire spring. Operated by pressure of the foot on the cap. Released by pressure on the tip.